Sands of time are running out on the marine mammal, which has suffered harm from gillnets, illegal fishing practices and human greed. GULF OF CALIFORNIA — An elusive and small marine mammal in the cetacean family, the vaquita porpoise – translating to “little cow” in Spanish – was not even discovered by humans until 1958, proof of their quiet presence. Sadly, they are currently one of the most critically endangered species in the world and their existence may be wiped out only 50 years after humans even realized they were here in the first place. At one time hundreds of vaquitas swan the ocean, then it was dozens, and now only a few are left behind. In November 2017, VaquitaCPR led a mission to rescue the last of the vaquitas, which scientists estimate is in numbers below 30. According to The Marine Mammal Center, the vaquita’s population, which is commonly found off the Gulf of California coast nowadays, has declined 92 percent since 1997. To the dismay of many who participated, the results of the rescue attempt ended in heartache. In order to begin a captive breeding program, a female vaquita porpoise was captured and transferred in a pen. Initially, the vaquita appeared fine, but events took a turn for the worst when she started showing signs of stress. The VaquitaCPR team decided it would be best for the porpoise to be re-released into the wild. As she was released, the vaquita swam out of her pen back into the ocean, and then took a strong turn, seeming disoriented. The vaquita died due to a heart attack from stress, and even though great lengths were made to revive her, it was too late. Darkness once again was cast onto the vaquita population. “When the death of the vaquita occurred, we released a public statement urging for the program to end,” Amey Owen of Animal Welfare Institute (AWI) tells The Log. In the statement by AWI, several concerning aspects of the program were discussed, mainly, “the loss of a reproductive female is catastrophic for the species’ future.” Concerns were also raised about a vaquita calf that was captured and then released due to stress; it is unknown how the attempt impacted the vaquita calf. June of 2017 saw Canada, the United States, and Mexico work together resulting in Mexico’s temporary ban on gillnets, a major cause of vaquita deaths; with the vaquita population so low already and natural issues, such as climate change and predators, there is no margin for additional failure. While banning the gillnets is a first step, the illegal fishing practices that still exist, caused mainly by a high demand for fish bladders in China, which are believed to have medicinal benefits though there is a lack of scientific proof to back this belief. The highly prized fish bladders of totoaba are larger than most fish and, an endangered species as well, they share waters with the vaquita that often get mixed in with the harvesting of totoaba. Bringing the vaquita population back from this point would indeed be a miraculous feat, but not one that is completely impossible. A classic story of a creature on the brink of extinction was the California condor. With the help of a captive breeding program, the California condor was able to get numbers in the 20s back into the 1000s. However, if the vaquita porpoise cannot be held for a captive breeding program, then what is next? “On November 21, AWI, the Natural Resources Defense Council and the Center for Biological Diversity filed a legal notice pressing the US government to ban seafood caught from Mexico’s Upper Gulf of California in an effort to save the last remaining vaquita porpoises,” Owen states. Among the most grisly practices that have impacted the vaquita population is the dangerous gillnet usage. Vaquitas become entrapped in gillnets, ultimately drowning. AWI has also launched the Boycott Mexican Shrimp Campaign. While a ban on shrimp would protect the vaquita, this would likely see a rise in the prices of seafood at restaurants and markets. Would most Americans go for this to save one species? As can be seen by the current political climate amid name-calling, threats, and more, there seems to be a lack of humanity concerning the lives of other creatures – a choice to treat another, human or not, as if it is inanimate, an insignificant thing that gets in the way of human corruption, greed, and reason. In this story, the bottom line is that profits from illegal fishing operations trumped the interests of protecting a small porpoise whose eating habits and lifestyle interfered. Unfortunately, the vaquita porpoise was a casualty of this way of thinking. Some might be quick to blame Darwinism: Maybe the vaquita just isn’t cut out for a world filled with illegal fishing traps, climate change, difficulty with reproduction – and those are just a handful of major threats that have gone against the vaquita porpoise. With such a critically endangered species, it is difficult to study how it contributes to the marine’s ecosystem, but just because something is small does not mean it does not have value. To make sure the vaquita does not join the ranks of extinction due to over-hunting/fishing as fellow marine mammal the Caribbean monk seal, declared officially extinct in 2008, it is up to the coastal communities to pass on facts regarding the plight of the vaquita. For now the vaquita clings to its survival until further strides are taken to completely protect it. As organizations such as AWI work towards a solution in the final hour, we wait to see if a plan can be presented that begins to recover the vaquitas lost. Human intervention is needed more than ever to keep the current waters vaquitas swim in from further disturbances, so they will be able to reproduce and re-populate as captive breeding programs no longer appear to be a viable or safe option. 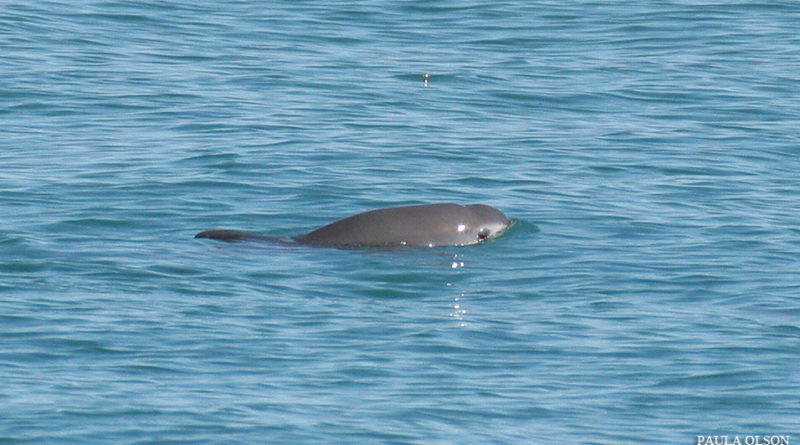 VaquitaCPR, even in the failure of the mission, urges us to sing the song of the vaquita. For more information about the protection of vaquita porpoises, visit awionline.org or marinemammalcenter.org.